FIRST Alum Cameron Schriner found lifelong friendships and a passion for helping kids succeed while part of his FIRST Robotics Competition Team 832 Chimera (O.S.C.A.R) in Atlanta, Georgia. 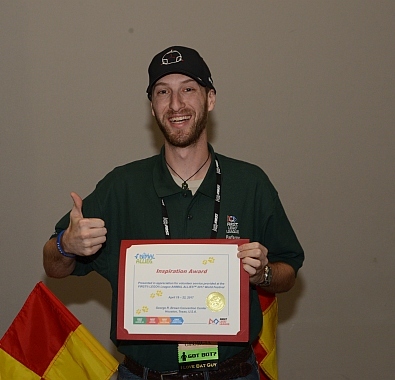 He is currently head referee for FIRST LEGO League in Georgia. “The kids I work with are teaching me as much as I am teaching them,” he says. I attended Georgia Tech at the Savannah Campus and majored in mechanical engineering. I got connected with a summer camp working for Georgia Teach CEISMC (Center for Education Integrating Science, Mathematics and Computing). Through this initial camp, I then created more camps around the LEGO® MINDSTORMS® NXT. I was training kids for competition, teaching programming, and mentoring teams. As a referee, I have heard so many stories from teams that want to build these awesome robots, but they tell me they can’t because they don’t have enough funding. In the future, I would like to assist teams with ways they can get the funding in order to build these robots, or to find a way to build robots on a budget! I met my best friend while he was my high school team mentor; he actually just got married, and I was in his wedding. Aside from meeting some great people, I have learned how to work with others on a team. Before I was involved with FIRST, I was very quiet and reserved and my team helped me break out and feel comfortable with participating on a team. Through the many connections I have made with others associated with FIRST, I became a FIRST LEGO League referee for Georgia and now am the head referee for the state. I have stayed involved with FIRST LEGO League since college. I like FIRST, but I love FIRST LEGO League! The kids I work with are teaching me as much as I am teaching them. Do you have any advice to current participants on how to establish a great network within the FIRST community? My advice to participants is that any team can always use some extra help. My first year with my FIRST Robotics Competition team at Peachtree Regional, I was sitting in the pit alone, and Woodie Flowers walked over to me and asked me why I was sitting there alone. I told him I didn’t know enough to help. Woodie then spent 30 minutes with me explaining to me that I don’t have to “know” how to help. From there on, I would go around the pits at every event and offer help wherever I could because I wanted to help others win.